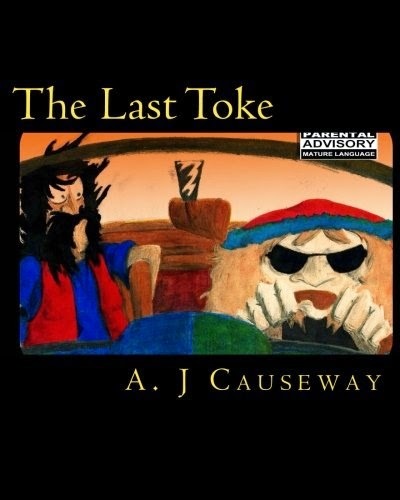 Today we are interviewing A. J. Causeway, author of the satire/black humor novel The Last Toke. Hello, I'm A.J. Causeway, some people would call me an old fool, some would just call me fool but others who dont know me would say i'm the Author of The Last Toke. I've lived in a few places and i plan to live in a few more, i worked as a hand model for 5 years but now i have arthritis and no-one is hiring no more. Describe the plot of your new book in a few sentences. Well this book tells the tale of Charco and Doc, a pair of small time crooks that work for the local crime boss named the Rabbi. We follow them through a week of their lives as they journey around the city in search of revenge, redemption and some good times. As in any good Road Movie the audience is introduced to a wide variety of characters that might or might not be integral to the story. The clinically depressed, the bored, the homeless. Haha i dunno, i guess anyone with a twisted sense of humor. There is a lot of samey samey old books out there now, so anyone who wants something new to read and enjoys a multimedia experience should give it a try. What inspired you to write a book about two crooks who discover that their search for the American Dream eventually turns into their nightmare? I guess you have to write what you know and it seems these are the things i know, i've seen the world lose itself, catch back up with itself only to lose the run of itself again. I've lived their lives and survived, many others i knew have not. A lot of people buy into the idea that the future is theirs, whatever they dream of they can achieve it but lemme tell you something that aint nuthing but fiction, most people well the people i know anyway they aint never get what they want no matter how hard they work. And if you are like the two main characters in this book and take what you want when you want it with very little hard work, it seems you still wont be happy, so what's it all about? What's the point of it all. Without a doubt Charco (Vernon Tackett) was my favourite character to write as i suppose one could say that he is me and i am him. Charco plays the main autobiographical role in this story and along with the narrator they give a shared insight into my voice. You’ve had quite an eclectic life, from working as a fisherman to being a musician to serving in two wars. Do you think this array of experiences influences your writing? Certainly, some of the people you meet in life can have a huge impact on your mental wellbeing, be it a healthy friendship or a malignant relationship. You definitely meet some strange ones on the road or overseas in a military uniform. All the characters that appear in my book will have some trace of real people and real situations that i found myself in down through the years. Your book is meant to be a multimedia experience, with a suggested soundtrack for each chapter. How did you pick each soundtrack? Well it was a long boring process of listening to and enjoying a lot of good music, a filthy job but someone had to do it...Seriously though the music is an important aspect to the reading experience as it helps create the mood and setting of each chapter. All the songs chosen had to all be from the time the story was set as to give a genuine feel of the era. Can you tell us about your writing process, from idea to finished manuscript? I seem to work backwards most of the time, i will get an idea for an ending and work my way back from there. For this book i knew i wanted the ending and the beginning to feature a television set, just like when you are in your livingroom you switch the T.V on for some entertainment and sit back and relax and when your done with it you get up and switch it off. The opening scene of the book is a T.V set being switched on and the last scene is one being switched off. Everything else is just filler. The Last Toke is the first book in a planned trilogy. Without giving too much away, can you tell us what to expect for the next two books? Sure, well its really a loose Movie Satire trilogy at best, this first book takes apart the Great American Road Movie while the second book will spoof the Big Budget Disaster Movie and will Feature Zombies, Aliens, End of the World Prophecies and all those other ways for the planet to end and the Third and final book will be some kinda Drama/Romance send up. Yes, it is available with all 40 illustrations, (Provided by Darren Murphy) and it is also available without the illustrations for a much lower price. You can find some of the illustrations on Facebook and Twitter under my name A.J. Causeway. Gently rolling down night terrors coast highway, ignoring the carrion, the undead hitch-hikers and the rotten fruit vendors, inhaling the saline rich air seeping from the salt lakes and briny pools where crippled Crabs await their turn to bleach their hair and carapaces, where desolate wooden limbs of ancient Spanish Galleons act as a deterrent warning you against treading too close, or trudging in for poisoned clams, where hungry Herons flap in the wake of some angry wave, disappearing over dips in the mutilated landscape. Hammering through Santa Morita Blvd, up into West Greenwood, towards the lavish home of the one-eyed Rabbi, that is where one unmistakable Wako Shark Corvette was now driving. Burning rubber and taking corners round basalt cliffs that Arthropods once signed their names stating that, “TRILL O’BYTE WAS ERE” like primitive graffiti in some primordial blood feud, a shrine to what was and what has been. Millennia may have passed and nations, races and creeds have come and gone all smashed upon these rocks but the purest essential essence of men once strived to build roads, beautiful big eight lane roads of asphalt that ran over the ghosts of Indians who when alive ran Buffalo off cliffs in the hundreds. Men built these roads so he knew where he was coming from not where he was going......All roads now not only lead to Rome but they also lead to destiny. Destiny 135 Maple Tree Drive... The Rabbi’s hellish abode.